Nouveau Plan de Paris Monumental. 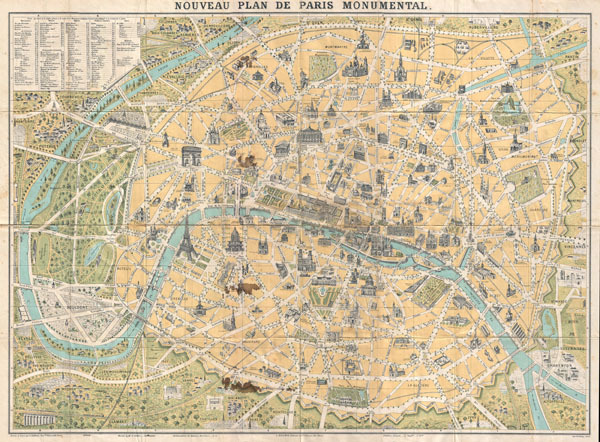 An attractive map of Paris, France issued in c. 1890 by L. Guilmin. Covers the old walled city of Paris and the immediate vicinity, especially to the west. Important buildings are shown in profile. All major streets are identified. Identifies numerous buildings and a number of surrounding communities and gardens, including the Bois de Boulogne. Very good. Original fold lines exhibit some wear - especially at fold intersections. Minor staining near Avenue de Saxe, near Pte. de Vanves, and near the Theatre Marigny.